Dubai, UAE, March 26, 2019: Saturday evening marked the conclusion of the Sultan bin Zayed Show Jumping Championship organized by the Emirates Heritage Club under the patronage of His Highness Sheikh Sultan Bin Zayed Al Nahyan, Representative of His Highness the President and Chairman of the Emirates Heritage Club at His Highness Sultan bin Zayed Grand Hall for Equestrian in Al Khatim. The national show was held in cooperation with the UAE Equestrian and Racing Federation (UAEERF) with Longines as the title sponsor, Official Time Keeper and presenting partner of the Emirates Longines Show Jumping league competitions. Many riders and horses representing various stables and equestrian clubs in the region participated in the competition that began Friday morning to compete in nine specific classes, in addition to a special round. This championship, implemented by the Emirates Heritage Club, is one in a series of competitions of which the current equestrian season is formed in cooperation with the Emirates Equestrian Federation (UAEERF), and in line with the guidance of H.H Sheikh Sultan bin Zayed Al Nahyan to ensure the vitality and glory of equestrian sports in the UAE. It also showcases the commitment towards creating promising generations of competitors in sports such as show jumping – it is the young riders that will continue to elevate the name of the UAE in the intensely competitive world of show jumping. His Excellency Abdullah Mohammed Jaber Al Muhairbi, the Executive Director of the Support Services in the club, and Mohammed Muhair Al Mazrouei, the Director of the village of Boudhieb and Boudhieb equestrian stables, awarded the winners of day one of the competition their share of a total purse of AED 170,000 including prizes from Longines. Day one of the competition started with a Special Two Phase class for Novices, Childre and Young Horses (4-5 year-olds) where jumps were placed at a height of 95-105 centimeters. In the Novice division, the UAE’s Moh’d Hassan Al Maqim and ‘Dany Mit Sahne’ representing Sharjah Equestrian & Racing Club came in first, while second place was taken by Omani Khalid Said Al Wahaibi riding ‘Coraggiosa 2’ from Al Safinat Stables and Al Ali Stables’s Jawad Sawas from Syria riding ‘Danturo’ came in third. In the Children’s category of the same round, the UAE’s Saif Abdulla Al Shamsi and his horse 'Dezapamillion Mas' from Sharjah Equestrian & Racing Club came in first, while the second place was taken by Palestinian rider. Omar Al Haj, and 'Parpica' who also represented Sharjah Equestrian & Racing Club and the third position was taken by Layth Ghurayeb on 'Quapitola' who were also from Sharjah Equestrian & Racing Club. As for Young Horses (4-5 year-olds) category of the same round, the first two places were secured by the UAE with Salim Ahmed Al Suwaidi riding on ‘Quidam’ of Sharjah Equestrian & Racing Club coming in first and Ahmed Ali Al Junaibi and ‘Jasja’ from the Emirates Heritage Club in second. Third place went to Mandara Equestrian Club’s Isabella Amelia Munday from Great Britain and ‘Istaboel’. For One Round Against the Clock in the Juniors’ category, the Syrian rider Mhd Farook Omar AlHosari and ‘Viking Des Embruns’ from Sharjah Equestrian & Racing Club came in first, while the UAE’s Abdulla Ahmed Ameen AlShurafa and his horse 'Tigerlilly' representing Al Shira'aa Stables came second and Sharjah Equestrian & Racing Club’s Mohamed Sultan Al Yahyaee from the UAE and 'Saga De La Roque' placed third. In addition, Italy’s Beatrice Girardi and 'Querida Dennehoeve Z' from Al Forsan Sports Resort won first place in the Division 2 category of the same round, while Sweden’s Ida Wilhelmsson riding on 'Lord of Arabia' from Sharjah Equestrian & Racing Club came in second. Third place was taken by Mandara Equestrian Club’s Hazzar Al Sabouni from Syria who rode 'Kylix Blue Star'. For the Young Horses (5-6yrs.) category of the same round, Syrian rider, Moh'd Fadi Al Zabibi, and his horse 'We'll See' representing Mandara Equestrian Club came in first, while Firas Hamamah from Syria and 'Grandira' from Al Safinat Stables came in second. In third place was Emirates Equestrian Centre’s Sheikh Rashid bin Ahmed Al Maktoum riding 'Invictus DXB’. As a special addition to Friday’s evening rounds, riders took part in a Father and Son Show Jumping Fun Class. In first place were Ahmed Al Junabi and his son Ali Ahmed Al Junabi with their horse 'Valentino' from Emirates Heritage Club, while Abdulaziz Al Marzooqi riding 'Ugoline de la Pierre' and his son, Omar Al Marzooqi, riding ‘Baghera’ from Al Shira’aa Stables came in second. In third place was Fadi Zbibi and his son Osama Zbibi with 'Paprika' who represented Mandara Equestrian Club. In the One Round Against the Clock class - UAE Riders category with obstacles placed at 135 cm, the UAE rider, Moh'd Shafi M. Al Remeithi, and 'Puck' from the Emirates Heritage Club achieved the top spot, while Sharjah Equestrian & Racing Club’s Hamad Ali Al Kirbi from the UAE and 'Uxmal D'ysieux' came in second with third place going to Sheikh Ali Bin Abdulla Al Qassimi and 'Itchy Van Het Lambroeck' from the Sharjah Equestrian & Racing Club. On Friday's closing competitions of One Round Against the Clock for Division 1 (advanced riders) wherein jumps were placed at a height of 130 - 135 cm, Greek rider, Dimitrios Natsis, and 'Calista De La Hart' from Sharjah Equestrian & Racing Club came in first, while KSA’s Ramzy Al Duhami riding on 'High Quality J' representing Al Habtoor Polo & Equestrian Club came second. Third place went to Joao Maria Marquilhas from Portugual and 'Glamour Es' from Al Hamra Equestrian Centre. The championship’s second and final day witnessed the remaining five rounds with a purse worth AED 345,000. In the Arabian Horse Show Jumping Class category, first place went to Ajman Equestrian Club’s Ali Abdulla Al Kumaiti and ‘Arif’, while the second place was taken by Sultan Ahmed Al Tabbali and his horse ‘Marwah’ from the Emirates Heritage Club. In third place came Al Ruwwayah Stables’s Holly Ann Coward and ‘Merimindi Nike’. Further, in the second round of the Two Phases competition for Novices, Children and Young Horses (4-5 year-olds) wherein obstacles were set at a height of 105 cm, the first place went to Emirati rider Moh’d Hassan Al Maqim and his horse 'Dany Mit Sahne' from Sharjah Equestrian & Racing Club in the Novices category. Second place was taken by Oman’s Khalid Said Al Wahaibi and 'Coraggiosa 2' from Al Safinat Stables and in third place came the UAE’s Saeed Ahmed Al Shemeili and 'Domingo Van Het Lindenhof’ from the Supporting Unit. As for the Children’s section of the same round, Emirati rider Abdullah Hamad Ali Al Kirbi and ‘Lover Des Patis' representing Sharjah Equestrian & Racing Club came in first with second place going to Paletine’s Omar Al Haj and 'Paprica' of Sharjah Equestrian & Racing Club. In third came Sharjah Women Sports Club’s Haya Ali AL Shamsi from the UAE and 'Celtic’. Also, in the same round for Young Horses (4-5 year-olds), the UAE dominated. First place went to the rider Salim Ahmed Al Suwaidi and his horse 'Quidam’, while second place went to Mohamed Hamad Ali AL Kirbi and 'Billy Gem' from Sharjah Equestrian & Racing Club with Ahmed Ali Al Junaibi and 'Jasja' coming in third. The UAE rocked the Juniors category of the Two Phases class for Young Horses (5-6 year-olds), Juniors and Division 2 Riders where first place went to Omar Abdul Aziz Al Marzooqi and his horse 'Coral Beach Z' from Al Shira'aa Stables, with second place going to Emirates Heritage Club’s Abdulla Yousef Al Jneibi and 'Vitaline Du Moutier'. In third came Sharjah Equestrian & Racing Club’s Mohamed Sultan Al Yahyaee and 'Saga De La Roque'. Also, in the same round for the Young Horses (5-6 year-olds) category, Ramzy Al Duhami and 'Natil' won first place, while Moh'd Fadi Al Zabibi and 'We'll see' came second with third place going to the UAE’s Rashed Moh'd Al Romaithi and 'Sabrina' from Abu Dhabi Equestrian Club. 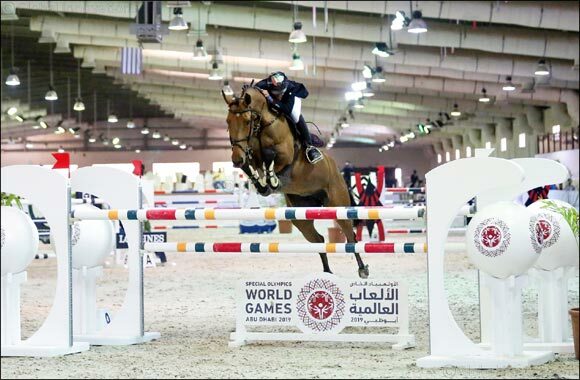 In the round for Division 2 riders, the UAE’s Mohammed Bakheet Al Qubaisi and 'Sanara Du Lozon' from Mandara Equestrian Club came in first, while second place went to Emirati rider, Mohammed Abdullah Ketait, and his horse 'Super Trooper' from Emirates Equestrian Centre. Third place went to Ida Wilhelmsson and 'Lord of Arabia'. Saturday’s evening rounds marked the conclusion of the competition. In the One Round with Jump Off-UAE Class where jumps were set at a height of 145 cm, the rider Ali Hamad Al Kirbi and his horse 'Baloucenta' from Sharjah Equestrian & Racing Club came in first place, while Moh'd Shafi M. Al Remeithi riding on 'Puck' came second. Third place went to Sheikh Ali Bin Abdulla Al Qassimi and 'Itchy Van Het Lambroeck'. During the One Round with Jump Off competition for Division 1 riders where obstacles were placed at a height of 130 - 140 cm, Syria’s Hicham Gharib and 'K.Abrax' from Al Ali Stables came in first. Second and third places went to Jordan’s Sara Hussein Saleh Al Armouti and 'Centorito' from Sharjah Equestrian & Racing Club and Moh'd Shafi M. Al Remeithi and 'Beyond Fellow Dancing', respectively. The final class of the show, a One Round with Jump Off for Division 1 riders saw Anita Annika Sande and her horse 'For Cash' from Elite Stable coming in first. Second place went to Khaled Helal Al Khatri and 'Sierra' from Emirates Heritage Club with Maysam Besharat and 'Un Dollar De Blondel' from Mandara Equestrian Club coming in third.